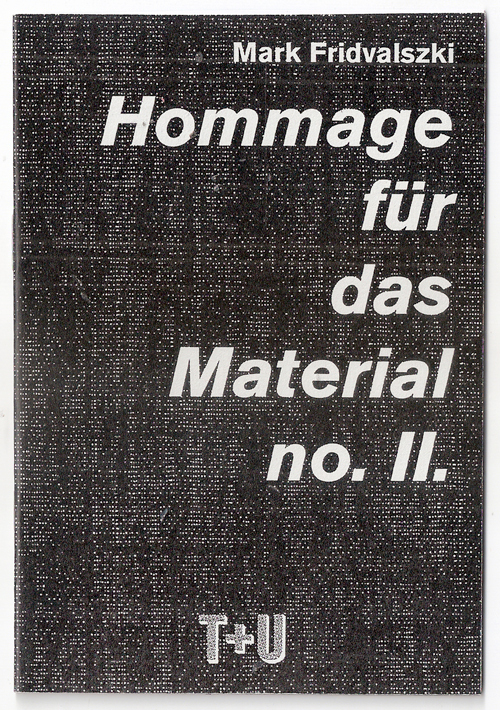 "Hommage für das Material II." 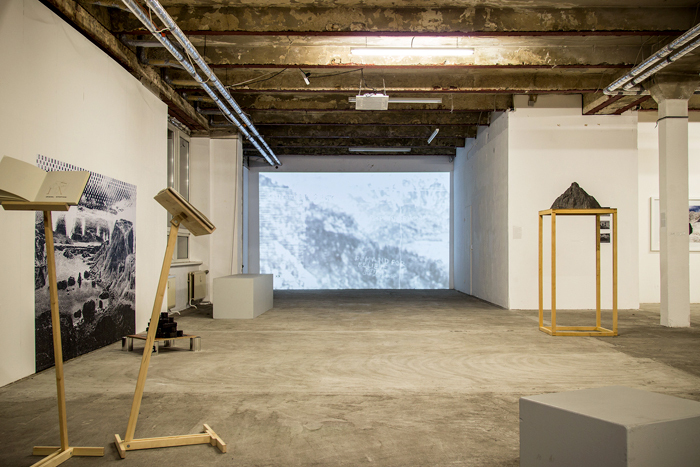 The installation atmospherically depicts the poetics of the circulation of matter. Since the birth of our Universe, matter perpetually changes, aggregates, breaks, and alters. Matter persists or exists in a constant state of flux; matter is an intelligent structure and an organizing principle. In the three dimensional space, we are manifested through matter as well. Matter is familiar to us, we presume to know it, both when observing it from the outside and when focusing on ourselves. Nevertheless, on a universal scale, visible matter (like fresh-water) is a rarity, the result of a long, patient process, and a particular constellation. In Hommage für das Material no. II. the invisible dark matter of the Universe metaphorically appears and covers a pile of coal. The dominating cosmic matter spreads over ancient plants that eventually became our common source of energy, thus manifesting the planetary circulation of matter. 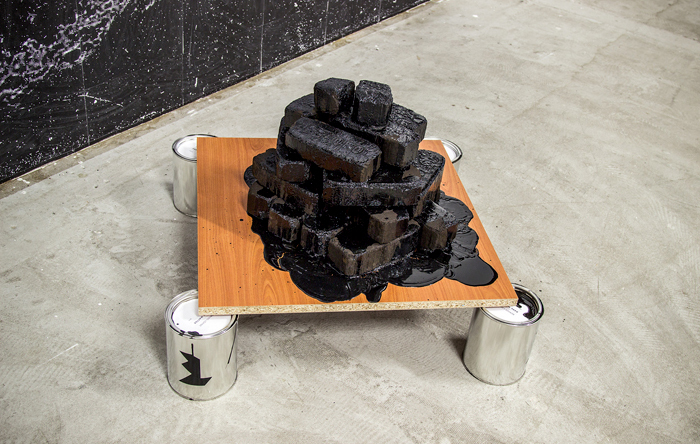 Metallic tanks, as corporate Atlas sculptures hold their own content on a wooden plate in front of a black and white scenery, gradually vaporizing into geometrical forms. 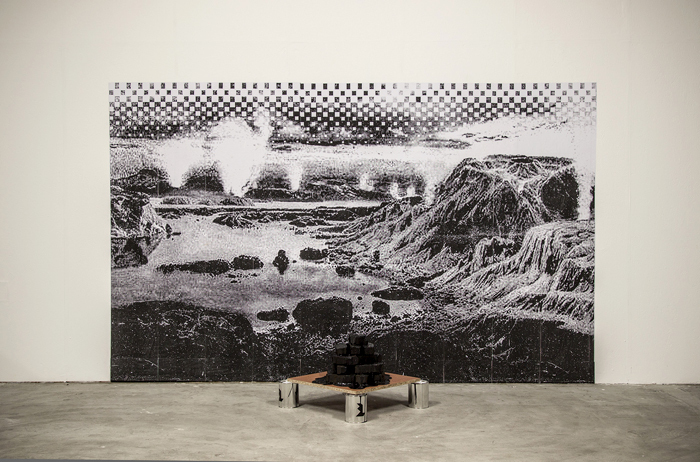 In this case Dark Matter, a work by Borsos Lörinc, is not as originally conceived pointing at the notions of power, liberation, and destruction through the marketing and selling of the artist's black color, but becomes an appropriated means to alienate the concept of matter.